Good morning! 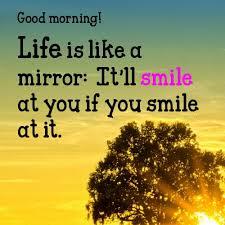 Smile - it's going to be a beautiful day! Good morning everyone! I hope that you all are having a great day so far!! I saw this and wanted to share it :) I love that, smile and it will smile back, I believe that. Most days you will definitely see smiles on my face throughout the day but, of course we can all have a bad day now and again, after all we are human. And that includes myself. Having a bad day is just a part of living life but, smiling and just going with the flow is living life. That's what I think of it all as. I know that life can give us all kinds of bumps in the road, but, at the end of the day, its up to us to keep moving forward and know that whatever the issue is won't last forever or you can lay down and just stop moving all together. I feel for those that do that. I did that back in my younger days. I listened to what other's had to say about me and most of it behind my back (family) and I just learned I guess to live with it and believe what they said and that I was nothing and I would never be anything. And then one day about 4 years ago I woke up and realized this is crap and I am NOT going to put up with anymore of the crap and today I'm not!! I stood up for myself and I feel so much better about everything! I have way less stress on me from the negative bs that was said about me and the just the negative people around me. Those are no more!!! I live life the way that I want too and if you don't think that I'll make anything of myself, okay that is your opinion which by all means you have a right too. BUT it doesn't mean that I am going to listen to it and believe it! I've been on my own for quite some time now. My family (kids and hubby) aren't all together like we use to be in one house but, we are still a family. My family that put me down and has no faith in me (mom/aunt and a few cousins) they can say and think whatever they want too and that is fine. But for me, I am living my life for me and I am enjoying it. I don't like gossip and drama! I don't talk about others behind their backs. I let them know what I think if I have something to say. With that being said I haven't talked to my mom in a few months and that was only for a couple of minutes but, I will flat out tell you what I think and feel these days if you tell me that I can't or won't do or be anything. I learned how to speak up and I am proud of that!! As I should be!! Everyone should speak up and not let anyone put them down! !